The online world is spawning all kinds of businesses (known as e-commerce), and eBay is the superstar. Originally, eBay grew — person by person — across the country (and soon around the world) as people peddled their own stuff from their homes and collections. Now, eBay is also a marketplace for new merchandise. eBay doesn’t sell a thing. Instead, the site does what all good hosts do: It creates a comfy environment that brings together people with common interests. eBay puts buyers and sellers in an online store and lets them transact business safely within its established rules. Join eBay’s online marketplace for free. All you need to do is fill out a few forms online and click. After you register, you can buy and sell anything that falls within the eBay rules and regulations. Understand that the eBay home page is where the general public first visits eBay. The visitors conduct searches, find out what’s happening, and begin to browse the site. The My eBay page is a good place to start your eBay adventure. From the My eBay page that you create, you can keep track of every item you have up for sale or have a bid on. eBay charges a small fee (sometimes it’s even free during promotions) for the privilege of putting your item on the site. When you list your item, millions of people (eBay has over 100 million registered users) from all over the world can check out your goods and buy or place bids if you’ve listed an auction. 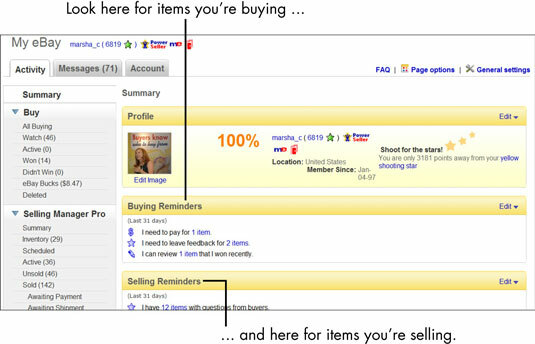 Other eBay members must bid on your item for you to make money on an auction listing. With a little luck, a bidding war may break out and drive the bids up high enough for you to turn a nice profit. After the auction, you deal directly with the buyer, who sends you the payment either through a PayPal or with a credit card through a payment service. Then you ship the item. You can run as many listings as you want, all at the same time.. 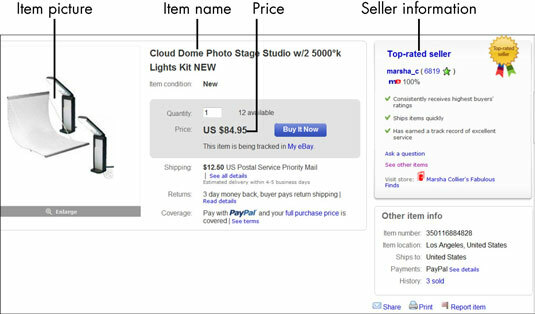 Discover the process for finding what you want on eBay. If you’re a collector or you just like to shop for bargains on everyday goods, you can browse 24 hours a day through the items up for auction in eBay’s tens of thousands of categories, which range from Antiques to Writing Instruments. 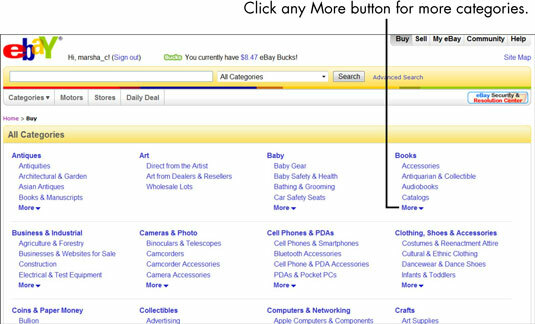 Use eBay’s search feature — available from any eBay page — to find the item you want. Then do a little research on what you’re buying and who’s selling it, place your bid, and keep an eye on it until the auction closes.